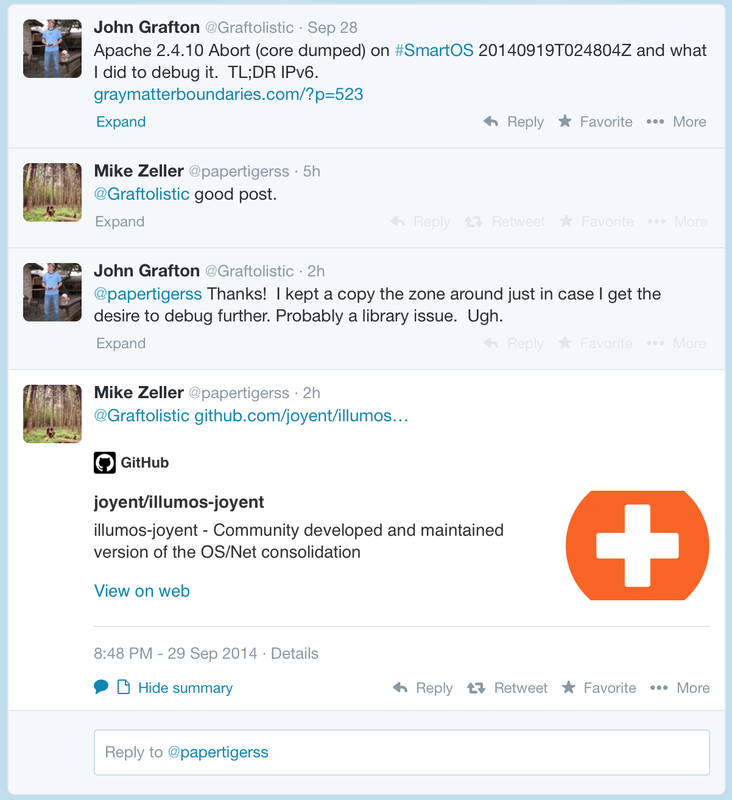 Just a few hours after posting this, Joyent committed the fix to the Illumos kernel on github. Kindly, Mike Zeller informed me of that fact on Twitter. I love the internet and open source software. Recently, I upgraded my home SmartOS server to 20140919T024804Z. Generally this is a simple process where I download the latest USB image from smartos.org, image it to a 2GB USB stick, and boot from it. This process usually takes no more than 10 minutes to complete. This time, however, was a bit different. I wasn’t able to reach the apache server on one of my zones (megaman). Running svcs -xv quickly told me that yes, apache was not running. Reason: Start method failed repeatedly, last dumped core on Abort (6). Tailing the service log, I found that the httpd binary was returning an ABRT signal. [ Sep 27 23:22:26 Method "start" failed due to signal ABRT. This was very strange considering apache has worked perfectly in megaman for years. At this point I had only updated SmartOS but none of the pkgsrc packages on the zone. My guess was that something was amiss between the application on the zone and the new system libraries. I used pstack to glance that the process stack of the core file. getipnodebyname appeared to be causing the ABRT of the httpd process. I decided to capture parameter information for getipnodebyname to determine what caused it to go haywire. MDB to the rescue! libc.so.1`_lwp_kill+0xa:jae +0xc <libc.so.1`_lwp_kill+0x18> mdb: You've got symbols! Cool, ABRT in mdb too. Now on to the interesting part. Run the ::stack dcmd and find the hostname that was sent to getipnodebyname. fffffd7fffdff420: 3a3a00ff 7ffdffff 3eb33bff 7ffdffff ::……>.;….. See the first two bytes of the string? In hexidecimal it’s 3a3a. getipnodebyname appears to be failing while trying to look up “::”. A double colon is shorthand in IPv6 that means the equivolent of 0.0.0.0 in IPv4. My next thought was to disable the IPv6 interface to see if that made any difference. First run ipadm show-addr to find any IPv6 addresses. Ah, an IPv6 localhost entry. Disable the IPv6 interface lo0/_b. It works! No abort and the daemon started without trouble. svcadm enable apache also worked without a problem. Obviously, disabling IPv6 is decidedly not a permanent solution. A few months from now if httpd dies again, I don’t want to be scratching my head trying to remember what could be causing it. This is a good example of Technical Debt. Trading long term difficulties for short term “just getting it to work”. Best avoided. Luckily, this httpd daemon is running a simple web application that’s trivial to migrate to a new smart machine. After a simple imgadm import and vmadm create, I had a brand new zone. It just took a few minutes to migrate the application to it (now with LZ4 compression! ).